This is a very elegant, yet easy dessert. The tangy flavors of mango sorbet and raspberry sauce are tempered by the vanilla ice cream. The crushed chocolate peanuts add extra flavor and texture. This dessert is always a favorite with my family. My sister Jackie recreated this recipe after being served this dessert at the Grand Wailea Resort in Mauii. Slightly soften the containers of ice cream and sorbet by setting them out on the kitchen counter for a bit. With an ice cream scoup, scoup out balls of sorbet and vanilla ice cream. Place on parchment lined cookie sheet and refreeze until hardened. Each pint will yield three baseball-sized ice cream/sorbet balls. 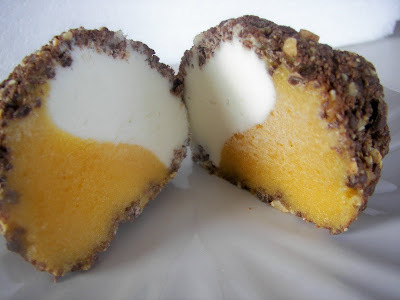 When ice cream balls are sufficiently hardened, cut each in half and place one half of a sorbet ball with one half of an ice cream ball. Roll in chocolate covered peanut crumbs and refreeze until hardened. 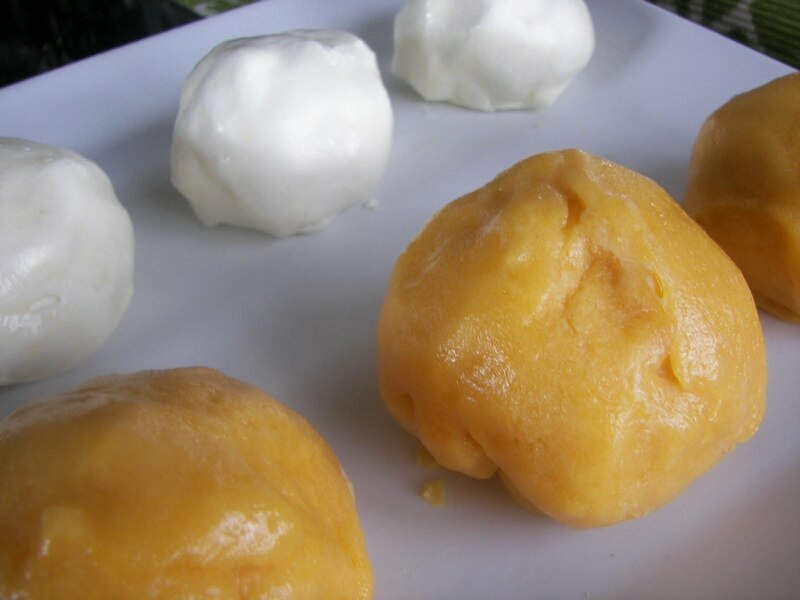 If your balls are not perfectly round, you can reshape them before refreezing. 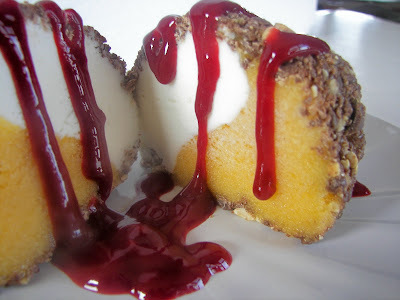 When ice cream balls are sufficiently hardened, garnish with raspberry sauce. Make sure you allow time for adequate freezing. If you want to serve this for evening dessert, you should begin in the morning. This recipe makes about 6 ice cream balls. Take raspberries and puree in blender. If using the 12 ounce package of frozen raspberries, unthaw first. Add some sugar to taste, from about 1/4 to 1/2 cup, and about 1 tablespoon of corn starch. Place berry puree in small saucepan and on medium heat bring to a boil. Remove from heat. If you want seedless sauce, place berries in a wire sieve and put a bowl underneath sieve. With a spoon or spatula, push puree against the sieve and continue doing so until the seeds are mainly dry. Around our house we love anything raspberries and at this point I am saying, "Don't lick the sieve!" I am posting this with Michael at Designs by Gollum for Foodie Friday. I am also posting this with The Hive, Utah Food Bloggers. This looks very nice! One question- could you put the 2 halves together initially instead of freezing and then putting them together later? Yum, wow, does this look good. Love the flavors you combined in this amazing dessert. The combination of mango and raspberries sounds so delish. wow those look great. I have never seen mango sorbet here, I hope I can find it. Looks very delicious. Love the raspberry syrup over top. You are right. This is an elegant dessert, one I would like to try out. Beautiful dessert! I'll have to try this one!! These look wonderful - and seriously yummy! This looks off the charts yummy! Wow! How lovely and delicious! Thanks for linking up with me for Friday Favorites!